In November of 1918, inspired by the poem “In Flanders Fields,” Moina Michael replied with her own poem, cited above. She then conceived of wearing red poppies on Memorial day to honor those who died serving the nation during war. She sold poppies as a fundraiser to benefit needy veterans. 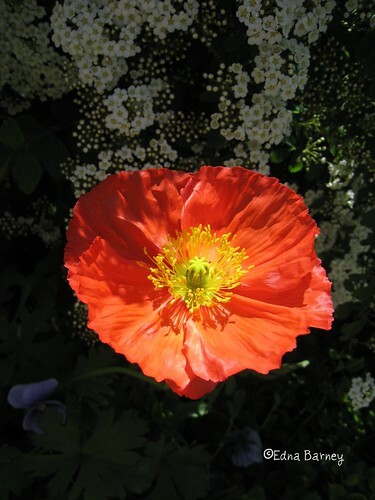 When Madam Guerin, a visitor to the United States from France, learned of this new custom she began making artificial red poppies to raise money for French war orphans and widows. The Red Poppy tradition spread to other countries. In 1921, the Franco-American Children’s League sold poppies nationally to benefit war orphans of France and Belgium. The League disbanded a year later and Madam Guerin approached the VFW for help. Shortly before Memorial Day in 1922, the VFW became the first veterans’ organization to nationally sell Red Poppies. Two years later their “Buddy” Poppy program was selling artificial poppies made by disabled veterans. In 1948, the US Post Office honored Moina Michael for founding the National Poppy movement with a three cent postage stamp with her likeness upon it. The image, Poppy at Lion House, was originally uploaded by Edna Barney. It is posted here from Barneykin’s account.